Kajal Agarwal is over the moon for she is all set to star opposite Surya in Maatraan, directed by K V Anand. The bubbly young actress, who returned from Dubai shooting for a Telugu film said, ‘Anand sir wanted me to sport an intelligent look. Works are on towards it. I am thrilled and going gaga over being part of Maatraan. 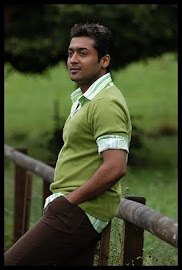 I am a great fan of Surya’. Meanwhile, Kajal is thrilled about the way her maiden Hindi venture opposite Ajay Devgan has shaped up. Says Kajal Agarwal, ‘Ajay Devgan is a great co-artiste. To act with him in the Hindi version of Singam is a delight. Born and brought up in Mumbai, it was my dream to act in a Hindi film. Now its fulfilled. I don’t find any difference working in Tamil, Telugu or a Hindi film’. visit http://www.dateleaf.com/pad/kajalfanclub and watch the videos of kajal agarwal latest movie songs and interviews and stills.